Depending on the time of the year there is a seemingly endless list of possible tastings, interviews, launches, lunches and dinners to attend. Let's be honest, if you want to get any work done, you have to choose carefully. It's simply not possible to cover everything. 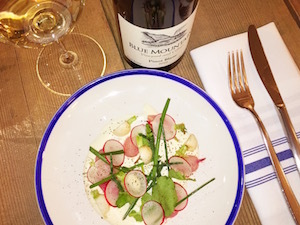 So, when a message arrived, stating that Matt Mavety, winemaker and member of the family-owned Blue Mountain Vineyard and Cellars was hosting a lunch at Royal Dinette to celebrate the winery's 25th anniversary, it was a no-brainer. I'd met Mavety on a few occasions - first in early 2011 when I interviewed him for an article in Vines Magazine. Let's say, he's most comfortable in the vineyard. On that note, I wasn't surprised to see it was a small group gathered. 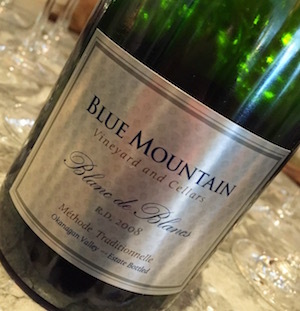 We started with his 2008 Blanc de Blancs as a reception before heading out to the back alley to safely disgorge (pop the crown cap off) his 2009 Reserve Brut. The remainder of the 2009s will be disgorged this fall, prior to release. Mavety and his sister Christie, have mostly taken over the reigns of the domain - although his father still plays a strong role. As Mavety says, "I have a father who is willing to accept and encourage a new energy." 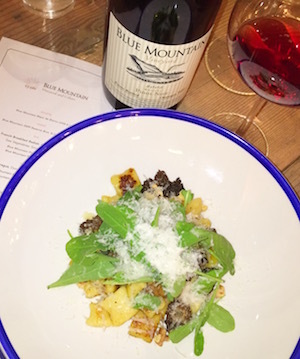 Don't mistake that as a sudden change in the classical house style at Blue Mountain, it's more of an organic process. "Our business has always been dynamic, " he says. He's quick to point out, "We're being pushed by outside influences, it is a slow process on how to improve." Part of that is a better understanding of the vineyard. While Mavety's father Ian has been farming the land for 45 years there are still things to learn and every vintage brings its own set of issues. "We work with nature, we get thrown curve balls", Mavety admits. The Mavety's have been farming sustainably (with cover crops, organic fertilizers and compost) throughout the estate's history and have challenged the French varieties they've planted. A cooler site requires suitable varieties, such as Chardonnay, Pinot Blanc, Sauvignon Blanc, Pinot Gris, Pinot Noir and Gamay. Ian Mavety, began making wine under the Blue Mountain label in 1991. Wisely he started slowly and vintage after vintage grew quantities. Matt returned to work on the estate in 1997. 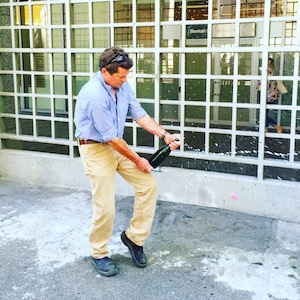 "Sometime in the mid-2000s I became winemaker... not sure exactly when. It depends on how the vintage is showing," he laughs. Since the turn of the century they've laid some big plans for slow change. You've probably not even noticed the subtle changes if you're a fan of the wines. These include using wild yeasts and challenging the wines by stressing them to go through malolactic fermentation on their own, which takes longer but helps draw more minerality out of the wines - a character that begins in the vineyard. 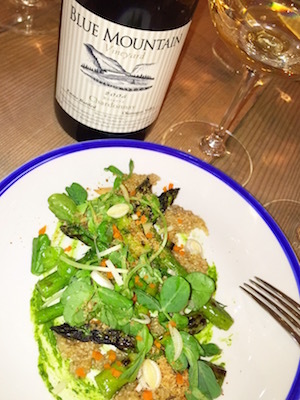 Additionally, Mavety is pulling back on oak influence yet ageing wines longer. "The last eight years have been interesting. Half of those vintages have been difficult." For example: 2015, a banner year for most in the Okanagan (and around the world) was a challenge with the heat. Managing quickly dropping acids on wine grapes known for their freshness, is a task. 2014 was typical, 2013 was a year of wasps, "We could barely get in the vineyard." Additionally there was a lot of disease pressure and a lot of crop was dropped. 2012 was fairly typical, 2011 was a wet and rainy year - again with moisture, disease pressure mounts. 2009, a vintage we all remember for the heavy frost at harvest and 2008, although typical had an atypically quick evolution at the end of the season, when the vines went from green to brown almost overnight. Perhaps the biggest hurdle Mavety has to face is the one he already has. Taking over the reigns of a classic, well-established domain and simultaneously keeping it relevant and consistent - all whilst juggling the challenges each vintage throws at him. He seems to have it well in hand, acknowledging it's not easy and there is a constant learning-curve. That's more than half the battle.